GixxerKat - KY Just ahh. 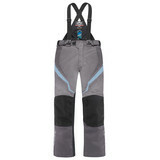 "Trying to find the perfect dual sport pants is hard to do. Not sold on these yet. Not as many pockets as my MX pants. Not as comfortable either. Warm. And decent for the money but not my fav." JayAce - Washington DC They fit! "Haven't had the opportunity to take them for a ride yet sadly. But out of the box impressions are very good. It has been a struggle for my 5'8" 170lb size 10 self to find pants that fit, have extra room for layering, and allow me to get my leg over my bike! I got the XL and these are long enough and have enough adjustability to get me through all 3, possibly 4 seasons for riding. There are no vents or exhausts and the fuzzy interior isn't removable but I can handle that for the price these had on sale. I love that they came with good armor for knees and hips. Now to find time to test them out... Looking forward to it!"